Pep: Time as Barcelona coach has been and gone. 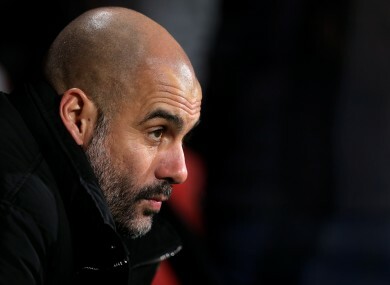 MANCHESTER CITY MANAGER Pep Guardiola says he will never go back to Barcelona as their coach amid growing uncertainty about present incumbent Luis Enrique’s future. Enrique is out of contract at the Nou Camp at the end of the season, and the chances of him leaving have increased significantly after a calamitous 4-0 defeat away to Paris St-Germain in the Champions League on Tuesday. That result, in the first leg of their last 16 tie, left Barcelona on the brink of elimination from the competition, and they also lag behind bitter rivals Real Madrid in the race to win La Liga. Athletic Bilbao coach Ernesto Valverde is reportedly a contender for the job if Enrique leaves, along with Eusebio Sacristan of Real Sociedad and Everton’s Ronald Koeman, who as a player scored the goal that secured them their first European Cup in 1992. Guardiola, who won 14 trophies in four years as Barcelona’s head coach, says he has no intention of returning to the job he left in 2012. No, I will never go back to Barcelona to be coach there. My period there is gone. Despite their stumbles, Barcelona remain the standard bearers of world football, according to Guardiola. “Barcelona are still the best team in the world,” said the 46-year-old Spaniard. “It’s always a surprise because they are so, so good, but in football anything can happen. “There’s a lot of competition, the opposition are so strong. You can win heavily or you can lose heavily, that can happen, it’s happened to me, but there are 90 minutes to go and anything can happen. If there’s a team who can do it, then it’s Barca, with their mentality. “When you have dominated world football, it’s normal that the people expect you to keep up that level, but my advice to you, knowing Luis and the players a little, is not to talk too much, because they will be back and prove you wrong. Email “Pep makes one thing clear about his future - he's never going back to Barca”. Feedback on “Pep makes one thing clear about his future - he's never going back to Barca”.